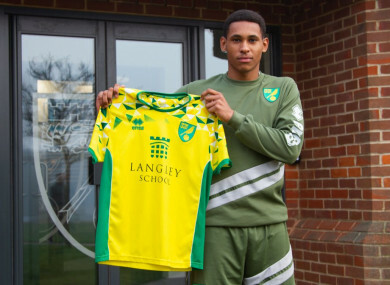 New Norwich City signing, William Hondermarck. NORWICH CITY HAVE announced the signing of 18-year-old midfielder William Hondermarck from Drogheda United. Hondermarck has been on trial with the Championship club in recent weeks, and featured in the final half-hour of the club’s U23s game against Leicester City on Monday. Speaking to Norwich’s official website, the teenager hailed the move as a dream come true. It feels like a dream. To have the chance to be involved in an environment like this is amazing for me. I’ve had a really successful trial period here. It’s been hard work with the quality and double sessions, but I’ve enjoyed every minute so far. Hondermarck was born in France, but moved to Ireland at the age of five. He has been involved in the Republic of Ireland set-up, and was called up to the U19 squad by Tom Mohan last year. He is currently in the process of getting an Irish passport. He made 14 league appearances for Drogheda last year, and starred in their 1-0 FAI Cup win over Shamrock Rovers. Hondermarck may be involved in tonight’s FA Youth Cup tie with Preston North End, who themselves may feature a couple of other Irish prospects: goalkeeper Jimmy Corcoran and midfielder Adam O’Reilly. He is Norwich’s latest Irish recruit, joining Adam Idah and Simon Power at the club. Idah is highly-rated, and the 17-year-old has been prolific for the club’s U23s. Power, meanwhile, joined from Cabinteely a year ago and is currently on loan at Dutch club FC Dordrecht. Email “Norwich City complete signing of teenage Drogheda United midfielder”. Feedback on “Norwich City complete signing of teenage Drogheda United midfielder”.